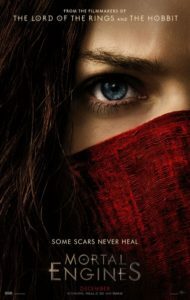 The first thrilling trailer for the upcoming steampunk epic, Mortal Engines, has just been released. The film is based on the book series of the same name by Philip Reeves, and is one of Peter Jackon’s big post-Hobbit projects. He’s actually been developing it since 2008 and now the project is finally going to see the light of day. The trailer really reminds me of Howl’s Moving Castle meets Mad Max: Fury Road. The film is set in a post-apocalyptic world where cities move around and devour smaller settlements. And since this is based on a young adult series, there is a central pair destined to save the world. But there are darker elements to this adaptation. The premise is intriguing and the visual effects are as impressive as ever so here’s hoping the story is as good as it looks. “Thousands of years after civilization was destroyed by a cataclysmic event, humankind has adapted and a new way of living has evolved. Gigantic moving cities now roam the Earth, ruthlessly preying upon smaller traction towns. Tom Natsworthy (Robert Sheehan)—who hails from a Lower Tier of the great traction city of London—finds himself fighting for his own survival after he encounters the dangerous fugitive Hester Shaw (Hera Hilmar). Two opposites, whose paths should never have crossed, forge an unlikely alliance that is destined to change the course of the future. Mortal Engines is due to be released on December 14, 2018.